People who develop relationships well have certain qualities about them. Qualities that allow them to make lasting impacts on people. To cultivate a feeling of trust and connection between people. These qualities allow them to foster a more happy and abundant environment. And milk more out of the human experience. But what are these qualities that will allow us to become an effective communicator. To build relationships that last and have an ample amount of substance? Well I answer exactly this below. 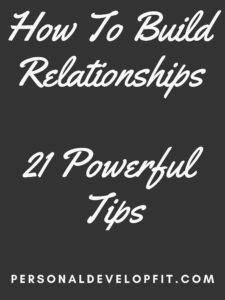 Offering the 21 best tips for building stronger relationships in your personal and professional life. The main thing about building better relationships is to seek to understand. Seek to understand where the person is coming from with empathy. Listen to relate to them, not relate one of your similar stories to their stories. Empathize with their feelings and emotions as they speak and feel. You are going through the ups and downs of the conversation with them. When you do this, you build much better relationships due to the fact that you are getting to know this person at a much deeper level. When you seek first to understand, you eliminate ego needs on your end. We all want to talk about ourselves. But when we refrain from doing so, we can really get to know the other person. You are able to dive deeper into the relationship. Much deeper than you would be if you were scratching the surface with normal talk. Phrases like this are open ended questions that require people to elaborate more. To where you become the person whom they can open up to more because of. Get lost so much in what the other person is saying. And keep provoking elaboration with questions like this above. Work your way through it for long enough and the person will feel distinctly different talking to you. They will feel that you care much more. Enough to dig deep and truly listen to what they are saying. During conversation, pause in front of them and show them that you are reflecting on what they say. You can also rephrase what they said in similar terms or similar fashion. Also, build better rapport by giving them your full attention with your sense and mirroring the body language. Also a general rule to help you become a better listener and communicator is to try to speak around a 1/3 of the time. Let them dominate the verbal side. And you dominate the listening side. This is more of an indirect way of building better relationships. Talking highly about someone who is not around makes you look like a great person. You can shower adoration about someone of whom you are mutually connected with amongst the people you are chatting with. This adoration will at most times, get back to people pretty quickly. It has much more impact on people when they hear about good things you say about them, then actually saying it when they are present. It also shows people the type of person you are. As we have all been around that person whom gossips to us about people. Which they are doing so to try to fit in with the group. But we know that when we aren’t around, they are most likely going to throw us under the bus. The same is true about someone who compliments people. They are more likely to do so about us when we walk away. We can trust this person. And know that they will speak highly of us if we are brought up. We can be that person in the group, or any group for that matter, that is this person. People know that you have good things to say. Hence trusting you more to open up to you and enough to build deeper relationships because of. This is easily one of the best tactics in building relationships I have ever came across. Being a connector means that you are always trying to connect other people together in ways that are beneficial to both of them. Both personally and professionally. You build better relationships because of this simply for the fact that you are seeking to HELP. Helping people is the easiest way to build better relationships simply because your are putting selfish desires aside. When you do so without trying to gain anything for yourself, people come to appreciate and respect you more. You are seen as a person who is trying to help people get ahead. And like Zig Ziglar said, if you help enough people get what they want, you can have all that you want. This includes having an abundant amount of good relationships. All of us adore ourselves. This is simply a fact. And when someone appreciates us, it goes a long way. You can become this person for people by remembering little facts about them. The teams they like, what sports their kids play, how they recently had a job interview, where they went to college. Remembering these things and then bringing them up goes such a long way. For example if their team wins a big game, send them an email or text about it. It is like depositing money into an account. By doing more of these acts, you accumulate more and more value within the relationship. The more deposits you make, the deeper the relationship becomes. And the more trust you build with them. This rule can apply to any relationship we ever have. When we first meet people, our senses are heightened. We are putting more physical and emotional energy into our interactions than we do when things progress and time goes by. But we can regain that spark that we originally created by treating is as if you just began the relationship. This includes being inquisitive about the person. Learning about what is new with them and what is going on in their lives. But treating is like the slate is clean. Completely fresh. This approach is tough to have with everyone we meet, but can be done with the people in our lives that we want to build better relationships with. People will appreciate the extra effort you are bringing to the relationship and will open back up and reciprocate. Allowing you to build deeper and more solid relationships. 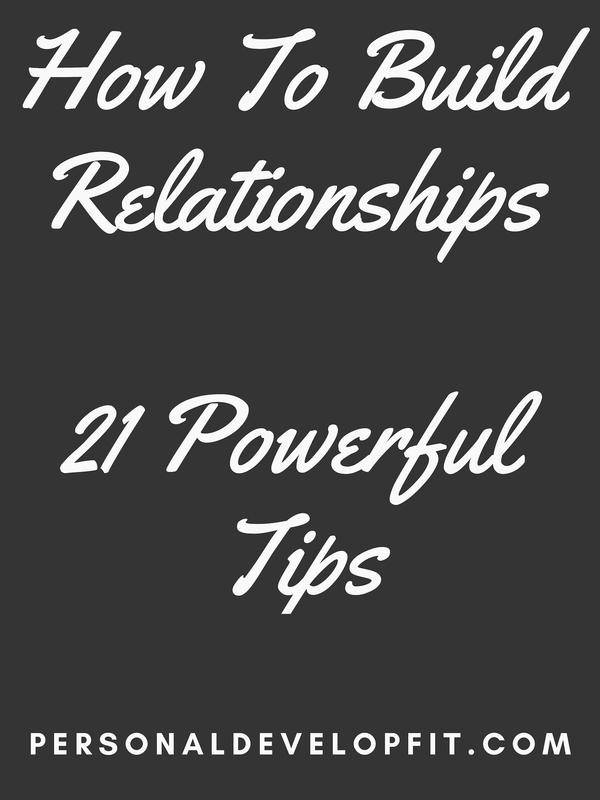 This also can allow you to go back and build a stronger foundation to relationships. So that your future interactions will be that much deeper and better. You will transcend surface level interaction to create something much more meaningful and lasting. Providing a level of acceptance to people that is at a higher level than normal, will move mountains. It can provide a feeling of safety to the people you are interacting with. Most people, whether they know it or not, judge pretty quick and pretty often. It is simply a fact. In fact we all do so. It is part of being human. But we can shift this automatic response and start being aware of it. Then working on providing a field of acceptance to whoever we come into contact with. The first step is to start to accept yourself. You can only give what YOU have. The amount of love you have is the amount you can give. The amount of joy you have is the amount that you can offer. The same thing is true about self acceptance. By starting with yourself, you can create a more accepting environment for the people in your life. Forgiving yourself and accepting you for who you are, starts the process of bestowing acceptance on others. 7.) Looking for the positive in people. The thing about acceptance or lack thereof is a pull between negative and positive. When you seek the see positive aspects about someone, you refrain from judgement. You can’t judge someone if you are only seeing the positive. This can include monitoring your thoughts with more awareness than usual. This will get you more cognizant about negative thoughts so you can let go of them. Or simply use them to find positives with. Flipping the coin on your negative thoughts. 8.) Refrain from black and white thinking. There are so many beliefs we hold. Most of them ingrained in us from childhood. But if we stray away from them and staring seeing things with more color, we can become more accepting. Just because we belive things doesn’t make them true. Or the end all be all. Recognize that people had an entirely different experience than you. That they are seeing the world from how they are, not how it is. We all are. Understanding this fact will allow us to become more accepting. Not only accept difference, but celebrate them. Admire people for being different then you. Reflect on how their differences are in fact intriguing to you. People can shut off once they learn that they are different from you. But you can keep the conversation going and the relationship building by celebrating their differences. Nobody brings perfection to their everyday lives. We are all simply human. We mess up. We have mishaps. But admitting your faults can help you bring much more trust and strength to relationships. If you don’t they will crumble. It take vulnerability to admit when you are wrong. Most people will not bring themselves to do this. But if you do, you will show people that you value them enough to have egg on your face in front of them. Even if it is something as simple as changing our perspective because you see theirs is more correct. Simply admitting this can allow someone to see you as a person whom puts the relationship over being right. A great quality to show when it comes to building and strengthening relationships. If you have all the answers, you can never grow a relationship, let alone yourself. It will stagnate and go down in flames. People are much more receptive to a warm smile. It shows that you are safe to talk to. It also shows that you are more emotionally available. That you aren’t closed off. A genuine smile will work great as most of communication is non verbal. And the easiest way to communicate your acceptance and approval for someone is to smile at them. Smiling provokes positive interactions with people. It creates a feeling that the conversation and the relationship are going in a good direction. And inspires trust in people to open up more to you. Diving deeper into the field of potentiality regarding your relationship. People often give feedback to us and we take it personal. We shut down because we don’t want to look like we don’t have it all together. But often times, people are giving feedback to help you. Not cut you down. And when you are open to the feedback, you present an environment where you can both grow from. The relationship can become one where you both learn from the other. As often we can’t see the things we need to improve in our lives. Next time someone gives you feedback, be wide open about it. The person will see that you are open to it and will continue to give you feedback. They will feel safe enough to expand on it. It will build a much more solid relationship between you two. Viewing it as feedback. Don’t take it personal. Even if it may be personal, you don’t have to take it as personal. Ask for it. The more often we ask for it, the better and more receptive we get when it comes into our existence. Also It puts the ball in your court. It lets you feel less attacked because you know it is coming. Instead of getting hit blindly with it. Listen completely. Push past the feelings of defending yourself. Being defensive simply cuts off all communication. Take what you feel was valuable out of it, and can the rest. You don’t have to take on all of it. Dissect it later on and take the gems that you can grow from. When I say win-win, I mean that everyone wins. Creating relationships in which you seek to win just as much as the other is winning. This will show people that you have a sense of justice. That you want to win and you want them to win. A sense that we are all in this together. That if they don’t win, you don’t win. This will create balanced interactions that are not only great for building relationships, but for great peace of mind. Unless it is benefiting in the building of good foundations and long term relationships, put the technology away. Be present with the person you are looking to create solid and deep relationship roots with. In a world where we are all checking our phones every ten minutes, you can make a huge impact on not doing so. This showing of devotion and respect to the other person will speak loudly. They will feel appreciated. Like their time is valuable. What they are saying is valuable. And most of all, they are being HEARD. People want to be listened to. You cannot actively listen to someone wholeheartedly if you are constantly thinking and checking your phone. If you can though, use it to build relationships with. Bring up something funny that you saw online that reminded you of the other person. A little random act of kindness like this can go a long way. I have talked about the benefits of personal growth in a few of my articles here. An act of which Tony Robbins refers to as constant and never ending improvement. The simple fact of the matter is that, if you seek a process of continual growth, actively doing things each day to grow, you will always have more and more value to offer. You will be giving to relationships more than you are taking. But that isn’t even the best part about it. The more you develop yourself, the more you like yourself. The more you life yourself, the better your treat others. The better you treat others, the more deeper your relationships will be. So it seems simple, but integrating something each day into your schedule that keeps you growing is imperative. It can literally change your life in all ways, shapes and forms. This is such a profound statement as it gives us insight into how humans retain information. We are so feeling based. We resonate and remember feelings much more readily and easier than we do what was said. So during the time where you are seeking to build relationships with people, work on evoking powerful emotions in them. Make them feel as if you care. Make them feel as if you are listening. When you create strong feelings and emotions in people, it puts in imprint on them. Both in a metaphorical sense. As well as at a cellular level. It will anchor in into their internal wiring. You can make a massive impact on people this way. Hence building excellent relationships. Often times we go through life, treating people like they are a number. Just a means to an end. But if we seek to communicate with people in a way to where we understand that they are a human with real problems. Possibly a very tough past. Or very serious current challenges. That they are here on this earth trying to do their best. Just like us. Seeing things from this point of view allows you to empathize with people deeply. It will also make a big impact on people when you do this because most people treat people like a number. You are seeking to understand people at a level much deeper than the average interaction. This makes people feel understood and cared for. It shows them that you care more about them and resonate with them in regards to the human experience. It gives a sense that you are THERE for them. At the end of the day, the questions we ask in conversation can create a longer lasting interaction. It also allows both people to grow from conversations. Which when done correctly, will make a more lasting impact on the person you are talking to. Have you ever been talking to someone and they ask you a question that really makes you think? Like pause and reflect, and then refine your answer as you go? This is a great example of someone looking to get to know you more. And in the process, leaving a small legacy in your life pertaining to this person. What celebrity do you most resonate with? And why? What are the things in our life that you feel most grateful for? If you could be told anything about your future by looking into a crystal ball, what would you want to know? If you can have lunch with anyone in history, either alive or dead, who would it be? If you were stuck on an island and could only have one thing from home, what would it be? Having these questions in your back pocket will give you some ammo when things may be running dry during conversation. Simply worlds like “we”, “us” and “ourselves”. These words create a feeling of connectivity. It makes people feel as if they are being included. Instead of saying things like you and me. It is creating a feeling that you are similar to them. That you hold similar values. That you are team. Instead of two different individuals. It will help you create a feeling of oneness. The act of encouragement is so damn powerful. It is said that often times we need someone to believe in us, until we start believing in ourselves. We can be this person to other people. Once you start getting to know someone, become familiar with their goals. The things they want to achieve in life. Who they want to become. Then do things that tell them how much you support them. Believe in them. And how they are going to accomplish everything they set out to do. We all need words of encouragement. I don’t care if you are the best sports player of all time. We all experience doubt in ourselves. But through positive words of encouragement, we can become that become of hope for people. We are all a little timid and hesitant on truly opening up to people. But when we do, it creates a lasting effect on the other person. And when received well, it allows you to feel as if you can open up more to this person. It also gives them the freedom to do so to you as well. It can show you that you have similar interests. You can make connections about the things that deeply matter to you both. Creating a web between each other that is created out of trust and understanding. When your actions are in line with your word you create the highest level of trust with people. You show people that you are a person of integrity. That you can be trusted. Not only does this make you look like a valuable and trustworthy person. But it also aligns with peoples moral compass. We like people that we can trust. We know that if we open up to a trustworthy person, they will keep our secrets safe. They will also allow us to feel safe when sharing our secrets. Vulnerability is not an easy quality to express. But the fact of the matter is, that you can allow someone to feel safe enough doing so. By simply starting off by being a person of your world. When you tell someone that you are going to do something, do it. And if for some reason you can’t, tell them. Then make it up to them very quickly. Simple as that. But such a powerful quality to develop. So there you have it my friends. How to build stronger relationships in your personal and professional life. I really hope you enjoyed this post. I would love to hear what you think about it. What value you got from it. As well as if you have any good tips to add that we can all benefit from. That will help us all build better, more loving and more caring relationships.